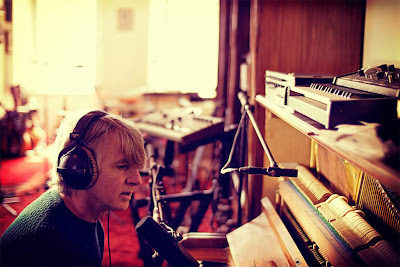 Discussions Magazine Music Blog: NEIL FINN: Info on 2014 album PLUS brand new video! NEIL FINN: Info on 2014 album PLUS brand new video! Dizzy Heights, the new album from acclaimed musician Neil Finn, will be released February 11 through Lester Records via Kobalt Label Services (KLS) The record, which follows his sophomore outing, Try Whistling This and One Nil (or One All), was confirmed during a webcast from Finn’s Auckland studio. The full webcast, which aired at BrooklynVegan and includes a performance of three new songs from Dizzy Heights, can be viewed HERE. Additionally, as a special preview, a short film created by Finn for the album’s lead track “Divebomber,” which was inspired by the World War II film of the same name, is now streaming on Finn’s official YouTube channel. An embedded version can be found below. Finn will celebrate the album’s release with special sold-out performances in Los Angeles at the Largo on November 19, and in and New York at McKittrick Hotel Maderley room on November 21 as well as at St. James’s Church in Piccadilly, London on November 27. Additional U.S. dates to be announced.